East Coast Earthquake? QUICK! To Twitter! An Earthquake hit Virginia today, and we felt tremors all up and down the east coast. 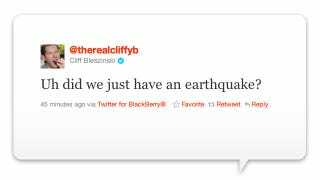 Instead of seeking shelter or whatever you do when an earthquake hits, the games industry took to twitter to make jokes. Seems reasonable to us.